... Of UFOs that is. This maroon sock is an adaptation of a pattern found in the Summer 2000 issue of Interweave Knits (Traveler's Stockings). It's written to fit an "average woman's foot", but since I have larger-than-average-women's-feet, I took it up a couple of needle sizes (from size 0 to size 2). I'm also doing short row heels instead of the heel flap type in the pattern. Another adaptation is that the pattern calls for some stitch decreases as you work down the leg toward the ankle, and I used fewer stitch decreases because I have heavy ankles. Oh, sigh. For some reason knitting these socks is very hard on my hands and wrists, so I put them aside (quite a few months ago) to work on something easier on my old arthritic joints. How do I like this pattern? Well, I like the smaller band of cuff-pattern you get when you knit on size 0 (looking at the picture in the magazine). 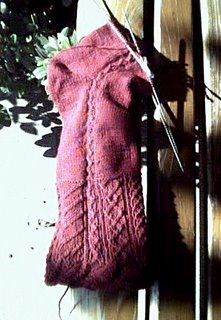 If I ever knit this pattern again I will most likely try to alter the pattern itself instead of just increasing the needle size. I've tried the sock on though (as much as I can at this stage), and it fits well, feels right and looks OK.
On the Vineyard Stripeys, I've gotten all the way around the heel of sock #2, so it's all downhill from here. Woo Hoo! From one knitting granny to another just popped in to thank you for your kind offer to forward a circular kniting needle to me in NZ. I have however just received today my order from Stick to your knitting and am very happy with them. Can't wait to start the magical knitting but "must" finish the current project first. Any bets on how long it takes me to cast on!! By the way love the socks, shawl etc.